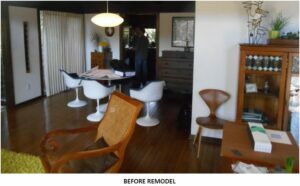 NJW Construction > news > PART II Mid-Century Modern Kitchen Remodel – CotY AWARD WINNER! NJW your home remodeling contractors and CotY award (Contractor of the Year) winners, are excited to share our CotY award winning kitchen! Take a look at PART II of this series, where we show you many “before” and “after” photos so you can witness the transformation for yourself! 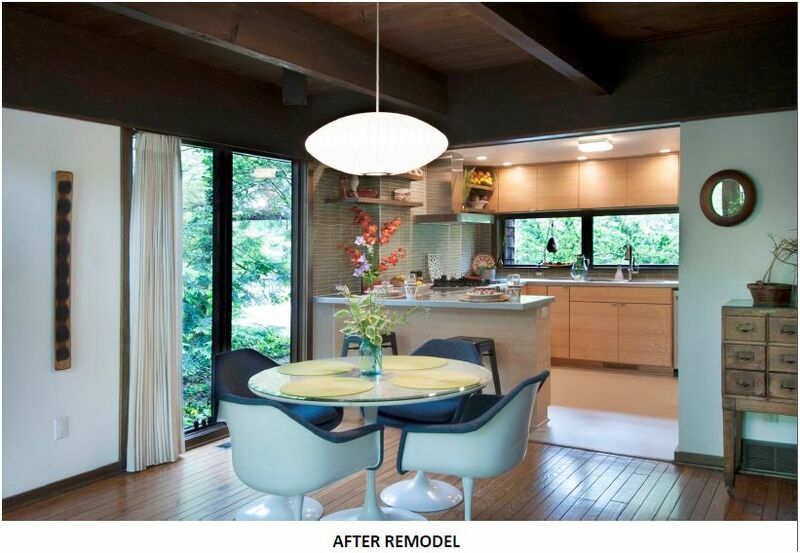 The original kitchen area was isolated by original dividing walls and pocket door system. The left dividing wall also had an adjoining pantry closet and double oven full height cabinetry system which needed eliminated to create the final open floor plan. 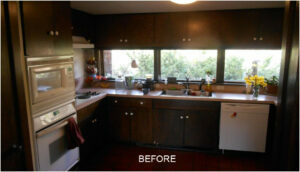 This 9’ wall removal created open site lines from every vantage point within this newly remodeled kitchen. It offered additional casual eating, as well as, conversational seating and finally a very comfortable and flowing entry to and from this kitchen area. The original kitchen was a closed in, U shape kitchen design with double oven and pantry closet to the left side and refrigerator & laundry chute built-in to the opposite wall. This left the space with very minimal working counter top area especially once other kitchen fixtures and appliances were taken into consideration. Check back with us next week as we dive even further into this kitchen remodel, we will be showing you even more before and after photos, as well as sharing some common kitchen issues and solutions! We currently build in Westerville, Worthington, Whitehall, Upper Arlington, Powell, Pickerington, New Albany, Lancaster, Hilliard, Gahanna, Dublin, Bexley, Columbus and all of Central Ohio.